Huntsman Advanced Materials announced the creation of two Araldite adhesives for RFID tags designed by TAGSYS, a supplier of item-level RFID tags and readers. Araldite® XD 4477-1 and Araldite® XB5304 were created by Huntsman’s adhesive experts to specifically bond together the plastic components of TAGSYS’ small and rigid Ario™ SL tags and give each chip an extra layer of protection so that their performance is optimized at all times. The RFID tags are subsequently being used in innovative traceability applications such as professional garment rental, maintenance and management by industrial laundries. Huntsman Advanced Materials announces the creation of two specialist Araldite® adhesives for use in Radio Frequency Identification (RFID) tags designed by TAGSYS – a global leader in the development of RFID systems. [UKPRwire, Thu Jun 14 2007] Huntsman Advanced Materials has created two specialist Araldite® adhesives for use in the electronics industry which are resistant to water, heat and cleaning chemicals. The adhesives were developed for TAGSYS – the global supplier of item-level Radio Frequency Identification (RFID) tags and readers. Araldite® XD 4477-1 and Araldite® XB5304 were created by Huntsman’s adhesive experts to specifically bond together the plastic components of TAGSYS’ small and rigid Ario™ SL tags and give each chip an extra layer of protection so that their performance is optimised at all times. 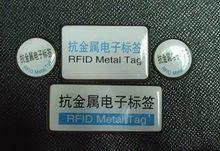 The RFID tags are subsequently being used in innovative traceability applications such as professional garment rental, maintenance and management by industrial laundries. RFID tags are revolutionising the identification and management of objects in a wide range of industries. Although most commonly employed for access control and in intelligent transport systems, their use is rapidly diversifying into other commercial sectors. RFID tags can help track and trace goods along the supply chain in a vast array of applications. Compared to barcode labels, they help cut manual handling costs by automating sorting processes and improving the flow and accuracy of electronic information relating to the lifecycle and maintenance of products. To date, TAGSYS has manufactured several million RFID tags using Araldite® adhesives. TAGSYS’ RFID tags, made using Araldite® XD 4477-1 and Araldite® XB5304, are being used at several industrial laundries, including in hospitals to help manage the uniforms of doctors and nurses. The RFID tag is patched onto the garment and can contain information such as the wearer’s name, the hospital and department they work in, the size of the garment and the number of times it has been cleaned. The use of RFID tags in this particular application significantly reduces the number of man hours required to sort clothing by hand, helps control theft and can improve overall laundry service productivity by 10 per cent. Because the RFID tags are washed with the garment, the integrity of the component is dependent on the performance of the adhesive that bonds it together and its ability to withstand temperature extremes ranging from -40◦c to 150◦c. Araldite® was the perfect solution, providing the required levels of resistance needed. To help TAGSYS, the adhesive R&D team at Huntsman moved the adhesive from being a three-component system to a two-component solution. Araldite® XD 4477-1 and Araldite® XB5304 are two-component, polyurethane-based adhesives. The products are white, cure quickly and provide excellent levels of adhesion when used on plastic substrates.